I'm 18, just graduated from high school and I LOVE reading! Reading is my escape from reality. I also love movies, music, and writing. I love any type of movies as long as their good. I also love any type of music but I prefer Indie Rock. I'm addicted to Pepsi and Coffee. I love sleep, so much that coffee has no effect on me anymore. In fact, coffee makes me sleepy. I'm very funny or at least I think so. My favorite books are The Hunger Games Trilogy, Twilight Saga, The Wolves of Mercy Falls Trilogy and a couple more. The first reason I started blogging is because I wanted to keep track of what I've read and my opinions on it. I had a journal but it started to rip and I would lose it all the time. So, I thought a blog would be a better option. The second reason is that I want to share my opinion on books. I haven't found one other person who loves to read as much as I do. None of my friends or family members really understand why I love to read so much. I have no one to talk about books with, so I was hoping that with the blog I could put my opinion out there and get others opinions back as well." I think your blog is fabulous. I will follow u on twitter too..
My first FF btw..Kinda excited to meet new peeps & follow new, cool, blogs too! Haha, I love those! Especially the vampire one. I choose Bones (from the Night Huntress series). Absolutely love the first one! Hehe! See I'm more of a Harry Potter fan so mine would say every girl needs a wizzard. I'm an old and faithful follower just dropping by to say hi! You're blog is as cute as ever! Hi. Old follower. Every Girl does need a vampire, so the stalkers stay away. Hi Alison :) I'm new to all of this--first #FF! my stuff is sort of bare bones at the moment but i'm working on it! Hi! I love the vampire one! Yes to every girl needs a vampire! Happy weekends! It took me ages to find my t-shirt! Eventually I just settled on 'Made In The 80s', lol. Oh I love that Vampire T-Shirt! The science geek in me loves your second pick Alison! This was a great question - I'm so looking forward to seeing what people have come up with! Love those shirts!! Very good! How awesome is that you are Rachel's copilot on Follow Friday? I think it's awesome! Love your shirts too :) Congratulations (again) and I hope you enjoy your weekend! 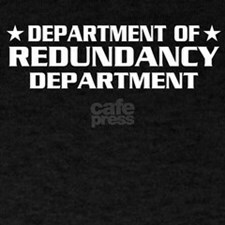 I love these, especially the department of redundancy one lol. New Follower, and just did my first FF. Hahaha I like the department of redundancy department one! And of course the vampire one, who doesn't want their very own hot vampire? Happy Friday Alison! I love the "Every Girl Needs a Vampire" one. LOVE IT. 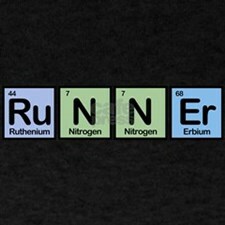 Cute "Runner" shirt- I want one that says "Nerdy" using element tiles. I love those t-shirts, especially the vampire one! Hope you have a great weekend! I love your T-shirt slogans, especially the redundancy department one. Hilarious! I think its just natural that two talented peeps like Rachel and yourself teamed up for the follow. You both rock! You are by far one of the most talented and dedicated bloggers out there. You always support your fellow bloggers! Have a great week! Happy Friday Allison! Have a great weekend! @Alison: That was the same response I had! I love the nerd aspect of the runner t-shirt. Happy Friday. Just stopping by! Blog Hop & Follow Friday! I believe that your t-shirt selections are fantastic. Awesome t-shirt picks! Happy Friday! Hi, Alison! Thanks for stopping by. To answer your question, I have red hair and a lot of it. LOL! I love your t-shirt choices. The redundancy shirt gave me a good chuckle. Have a great weekend! Hi Alison! Thanks for stopping by my blog again. I love your t-shirt choices, especially the first two. In response to your comment on my blog, I agree that "stupid" works for a lot of people. Hi there! Thanks for stopping by my blog. Love your shirt picks ~ especially the first one. Oh, and P.S. I was born in 81 too! So, yeah. Went to school in the 90's but seriously, the grunge look? didn't stick with me. But for some reason I hold a special place for mis-matched clothing, mesh and arm warmers. (Actually I own some leg warmers too, but don't tell anyone. I only wear them when I'm in a dress walking across campus during Winter Quarter. See? It's practical!). Thanks for stopping by my blog. Love the first shirt! 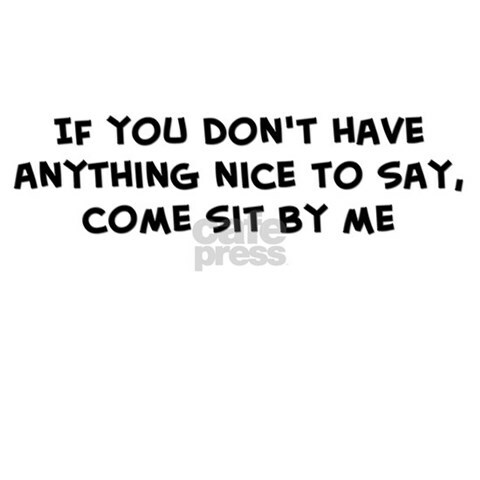 Love the "If you don't have anything nice to say..." shirt. Have a good weekend! Thanks for stopping by. I love the "every girl needs a vampire". Too cute. Old follower here! Thanks for stopping by my blog! I have just started listening to the new Bon Iver music. I have heard a few songs on the radio but still have to download the new CD. Thanks for the reminder! Here from the FF. Happy weekend!